This article is about the dissolved NCAA Division I-A conference. For other uses, see Big Eight Conference (disambiguation). The Big Eight Conference was a National Collegiate Athletic Association (NCAA)-affiliated Division I-A college athletic association that sponsored football. It was formed in January 1907 as the Missouri Valley Intercollegiate Athletic Association (MVIAA) by its charter member schools: the University of Kansas, University of Missouri, University of Nebraska, and Washington University in St. Louis. Additionally, the University of Iowa was an original member of the MVIAA, while maintaining joint membership in the Western Conference (now the Big Ten Conference). The conference was dissolved in 1996. Its membership at its dissolution consisted of the University of Nebraska, Iowa State University, the University of Colorado at Boulder, the University of Kansas, Kansas State University, the University of Missouri, the University of Oklahoma, and Oklahoma State University. The Big Eight kept its headquarters in Kansas City, Missouri. In February 1995, the Big Eight and the Southwest Conference announced that the two leagues had reached an agreement to form a new conference. The eight members of the Big Eight joined with SWC schools Texas, Texas A&M, Baylor, and Texas Tech to form the Big 12 Conference the following year. A vote was conducted on whether to keep the new conference's headquarters in Kansas City, and by a vote of 7–5 the conference members voted to move to the Dallas, Texas suburb of Irving. The two Oklahoma schools, all four Texas schools, and Colorado voted for the move while both Kansas schools, Nebraska, Missouri, and Iowa State voted for Kansas City. The conference was founded as the Missouri Valley Intercollegiate Athletic Association (MVIAA) at a meeting on January 12, 1907, by five charter members: the University of Kansas, the University of Missouri, the University of Nebraska, Washington University in St. Louis. The University of Iowa who was also a member of the Western Conference (now the Big Ten Conference) was also a joint member of the conference. Iowa only participated in football and outdoor men's track and field. In 1908, Drake University and Iowa Agricultural College (now Iowa State University) joined the MVIAA, increasing the conferences membership to seven. Iowa who was a joint member departed in 1911 to only compete in the Western Conference, but Kansas State University joined the conference in 1913. Nebraska left in 1918 to play as an independent for two seasons before returning in 1920. In 1919, the University of Oklahoma and Saint Louis University applied for membership, but were disapproved due to deficient management of their athletic programs. The conference then added Grinnell College in 1919, with the University of Oklahoma applying again and being approved in 1920. Oklahoma A&M University (now Oklahoma State University) joined in 1925, bringing conference membership to ten, an all-time high. At a meeting in Lincoln, Nebraska, on May 19, 1928, the conference split up. Six of the seven state schools (all except Oklahoma A&M) formed a conference that was initially known as the Big Six Conference. Just before the start of fall practice, the six schools announced they would retain the MVIAA name for formal purposes. However, fans and media continued to call it the Big Six. The three private schools – Drake, Grinnell, and Washington University – joined with Oklahoma A&M, becoming known as the Missouri Valley Conference (MVC). The similarity of the two conferences' official names, as well as the competing claims of the two conferences, led to considerable debate over which conference was the original and which was the spin-off, though the MVIAA went on to become the more prestigious of the two. For the remainder of the Big Eight's run, both conferences claimed 1907 as their founding date, as well as the same history through 1927. To this day, it has never been definitively established which conference was the original. 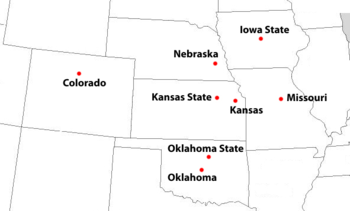 Locations of final Big Eight Conference full member institutions, 1957-1995. Conference membership grew with the addition of the University of Colorado on December 1, 1947, from the Mountain States Conference. Later that month, Reaves E. Peters was hired as "Commissioner of Officials and Assistant Secretary" and set up the first conference offices in Kansas City, Missouri. With the addition of Colorado, the conference's unofficial name became the Big Seven Conference, coincidentally, the former unofficial name of the MSC. The final membership change happened ten years later, when Oklahoma A&M joined (or rejoined, depending on the source) the conference on June 1, 1957, and the conference became known as the Big Eight. That same year, Peters' title was changed to "Executive Secretary" of the conference. He retired in June 1963 and was replaced by Wayne Duke, whose title was later changed to "Commissioner". In 1964, the conference legally assumed the name "Big Eight Conference". In 1968 the conference began a long association with the Orange Bowl, sending its champion annually to play in the prestigious bowl game in Miami, Florida. In the early 1990s, most of the colleges in Division I-A (now known as the Football Bowl Subdivision) were members of the College Football Association; this included members of the Big Eight and Southwest Conferences. Following a Supreme Court decision in 1984, the primary function of the CFA was to negotiate television broadcast rights for its member conferences and independent colleges. In February 1994, the Southeastern Conference announced that they, like the Big Ten, Pac-10, and Notre Dame before them, would be leaving the CFA and negotiate independently for a television deal that covered SEC schools only. This led The Dallas Morning News to proclaim that "the College Football Association as a television entity is dead". More significantly, this change in television contracts ultimately would lead to significant realignment of college conferences, with the biggest change being the dissolution of the Big Eight and the Southwest Conferences and the formation of the Big 12. After the SEC's abandonment of the CFA, the Southwest Conference and the Big Eight Conference saw potential financial benefits from an alliance to negotiate television deals, and quickly began negotiations to that end, with ABC and ESPN. Though there were complications over the next several weeks (some of which are detailed below), on February 25, 1994, it was announced that a new conference would be formed from the members of the Big Eight and four of the Texas member colleges of the Southwest Conference. Though the name would not be made official for several months, newspaper accounts immediately dubbed the new entity the "Big 12". Charter members of the Big 12 included the members of the Big Eight plus Baylor, Texas, Texas A&M and Texas Tech. Following the formation of the Big 12 Conference in 1994, the Big Eight continued operations till August 30, 1996, when the conference was formally dissolved and its members officially began competition in the Big 12 Conference. Although the Big 12 was essentially the Big Eight plus the four Texas schools, the Big 12 regards itself as a separate conference and does not claim the Big Eight's history as its own. ^ Colorado left the Big 12 for the Pac-12 beginning with the 2011-12 season. ^ Drake withdrew from the Missouri Valley Conference from 1951-1956. The MVC stopped sponsoring football in 1985; Drake remains a member for all non-football sports. The football program dropped to Division III in 1987, playing as an independent until a change in NCAA rules forced the program to play in Division I. When the new rule took effect in 1993, Drake joined the newly formed Pioneer League, a football-only league playing at the FCS level that prohibits the awarding of football scholarships. ^ Grinnell joined the Midwest Collegiate Athletic Conference beginning with the 1939-40 season; their affiliation from 1928-1939 is unclear. The MCAC merged with the Midwest Athletic Conference for Women to form the Midwest Conference beginning with the 1994-95 season. ^ Missouri left the Big 12 for the SEC beginning with the 2012-13 season. ^ Nebraska left the Big 12 for the Big Ten beginning with the 2011-12 season. ^ Washington-St. Louis left the MVC in 1946; it joined the College Athletic Conference from 1962 through 1971, and became a charter member of the University Athletic Association, which began play with the 1986-87 season. It was independent in all other years. * Kansas would have won the 1960 title, but after found to be using an ineligible player they were forced to forfeit their victories over Missouri and Colorado, which meant that Missouri was awarded the 1960 Big Eight title. ** Oklahoma would have won the 1972 title, but after found to be using an ineligible player they were forced to forfeit their victories over Missouri, Kansas, and Oklahoma State, which meant that Nebraska was awarded the 1972 Big Eight title. The following is a complete list of the 100 AIAW, NCAA and college football championships won by teams that were representing the Big Eight Conference in NCAA- or AIAW-recognized sports at the time of the championship. The national championships listed below are for the final eight members of the conference, as of July 2014. Football, Helms, and equestrian titles are included in the total, but excluded from the column listing NCAA and AIAW titles. The history of the Big Eight Conference straddles the era of racial segregation in the United States, particularly as it relates to African Americans. Before the formation of the conference, three African-American brothers at the University of Kansas are the first known to have participated in organized sports for a league school: Sherman Haney played baseball for KU beginning in 1888, followed by Grant Haney and then Ed Haney, the last of whom also played football at KU in 1893. At the same time, the University of Nebraska football team had on its roster George Flippin, the son of a slave, beginning in 1891. Nebraska's football team featured three more African-American players over the next 12 years. Notable among these NU players was Clinton Ross, who in 1911 apparently became the first African-American to participate in sport in the MVIAA, following the league's formation in 1907. The modern era of full integration of league sports began at Kansas State, with Harold Robinson. In 1949, Harold Robinson played football for Kansas State with an athletic scholarship. In doing so, Robinson broke the modern "color barrier" in conference athletics, and also became the first ever African-American athlete on scholarship in the conference. Harold Robinson later received a letter of congratulations from Jackie Robinson, who had reintegrated major league baseball in 1947 while playing with the Brooklyn Dodgers. In the spring of 1951 the conference's baseball color barrier was broken by Kansas State's Earl Woods, and in the winter of 1951–1952 Kansas State's Gene Wilson and Kansas's LaVannes C. Squires jointly broke the conference color barrier in basketball. Nebraska was the third league school to (re)integrate its athletic teams, with Charles Bryant joining the football team in 1952. Iowa State would be next, with Harold Potts and Henry Philmon reintegrating the Cyclone football team in 1953. The following season, Franklin Clarke became the first varsity African-American football player at the University of Colorado. In 1955, Homer Floyd became the first African-American to play football for the KU Jayhawks since Ed Haney in 1893. 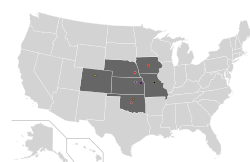 Sports teams at the remaining three conference schools (Oklahoma, Missouri and Oklahoma State) were subsequently all integrated by the end of the 1950s. This is a listing of the conference facilities as of the last year of the conference 1995-1996. 1 2 3 "BigEightSports.com". Retrieved August 13, 2013. 1 2 3 Murphy, Austin (November 28, 2011). "Bordering On Hatred: Rivalry Week will once again deliver must-see matchups, but this year's Kansas-Missouri showdown is like no other: It may very well be the last". Sports Illustrated. Retrieved 2011-11-25. ↑ "Big 12 Conference offices to be located in Dallas". The Fort Scott Tribune. Fort Scott, Kansas. Associated Press. February 3, 1996. ↑ "Oklahoma Refused". Lawrence Journal-World. Lawrence, Kansas. May 31, 1919. ↑ "Oklahoma Aggies in Valley Group". Lawrence Journal-World. December 6, 1924. ↑ "Big Six Grid Squads Take Field Tomorrow". The Milwaukee Sentinel. Associated Press. September 16, 1928. ↑ Fullerton, Jr., Hugh (May 27, 1947). "Sports Roundup". Sarasota Herald-Tribune. Associated Press. 1 2 "Group To Ask NCAA Opinion". St. Petersburg Times. Associated Press. May 19, 1957. ↑ Maisel, Ivan (February 12, 1994). "SEC Officially Leaves CFA; Big East Will Follow Soon". The Dallas Morning News. Retrieved August 25, 2012. ↑ "Politics played big part information of Big 12". The Deseret News. February 28, 1994. Retrieved June 20, 2012. ↑ "Texas Giants Merge With Big 8". The Nevada Daily Mail. Associated Press. February 27, 1994. ↑ "Presidents Decide on Name: Big 12". Lawrence Journal-World. Associated Press. May 13, 1994. ↑ "Politics played big part in formation of Big 12". February 28, 1994. Retrieved August 26, 2012. ↑ "Iowa State University fall enrollment soars to a record 28,682 students". Iowa State University. Archived from the original on 19 July 2011. Retrieved 14 August 2011. ↑ "Kansas State University Fact Book 2010" (PDF). Retrieved 2011-08-15. ↑ "New Semester Sets Records". Retrieved 22 August 2011. ↑ "NU enrollment highest in 13 years; up for 5th consecutive year". nebraska.edu. Archived from the original on 20 July 2011. Retrieved 14 August 2011. 1 2 3 "Summary ALL DIVISIONS/COLLEGIATE TOTAL CHAMPIONSHIPS" (PDF). Retrieved March 20, 2014. ↑ "Reaves Peters, Ex-Big 8 Head, Dies of Cancer". Kansas City, Missouri: Lawrence Journal-World. January 31, 1966. Retrieved 12 June 2012. ↑ "Big Eight Conference basketball history" (PDF). Big 12 Conference. Retrieved August 13, 2013. ↑ "Big Eight Conference football record book" (PDF). Big 12 Conference. Retrieved August 13, 2013. 1 2 "Athlete Who Broke Big 12 Race Barrier Dies". CBS College Sports. May 13, 2006. Retrieved 2010-03-17.